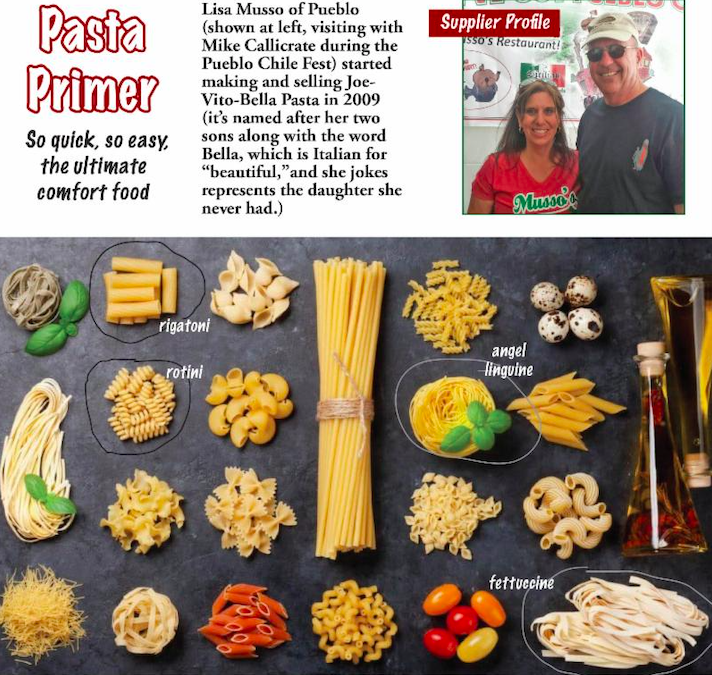 In-store selection typically includes angel linguine, fettuccine, rigatoni and rotini. When selecting pasta, the most important thing to consider is whether you’ll be eating your dish by stabbing it or twirling it. Shorter, stockier shapes are best served in chunky dishes laden with hunks of meat, beans or roasted vegetables. Rigatoni (like penne) is tubular, so it can capture small, slippery ingredients like green peas or toasted nuts or seeds and also has ridges on the outer surface to help sauces cling. Similarly, rotini (the newest addition to Lisa’s Joe-Vito-Bella line) is compact so it stands up to stir-frying and bakin gas well as adding to salads; the twisting spirals are good at grabbing yummy sauces and dressings. (Try combining it with your favorite sausage, beans and greens, then shower it with freshly grated parmesan.) Long noodles like angel linguine, which resembles a very fine spaghetti, and wider, flatter fettuccini work best with smooth, silky sauces. And of course both work well with ground meats! Preheat oven to 400 degrees. Heat olive oil in large skillet over medium heat; cook onion and brown sugar, stirring occasionally, for 15 to 17 min or until tender and deep golden. Add ground meat (can use beef, pork, chicken, lamb, turkey or a combo) garlic, sage, rosemary, salt and pepper, stirring with wooden spoon to break it up. Cook 3 to 5 min until browned. Add squash and broth; bring to boil. Reduce to simmer; cover, cook 3 to 5 min or until squash is just tender. In large pot of boiling salted water, cook pasta until al dente; drain, reserving 1/2 cup pasta water. Toss together pasta, water, squash and cheese; transfer to 13×9-inch glass baking dish. Sprinkle with parmesan; bake for 10 to 12 minutes or until cheese is melted and golden. Sprinkle with parsley and serve.